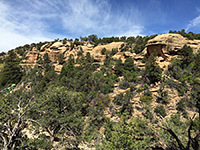 At 2.8 miles (loop), the Petroglyph Point Trail is the second longest of the limited number of hiking paths in Mesa Verde National Park; only the Prater Ridge Trail in the north is longer, and the route is popular since it offers the only opportunity to view ruins and rock art in a backcountry setting, not on a guided tour. The trailhead is beside Chapin Mesa Museum, near the park headquarters, from where the first part of the loop is along the paved path to Spruce Tree House, the third largest cliff dwelling in the park. The petroglyph trail branches off just before the ruins then heads south, along the east side of Spruce Canyon close to the plateau rim, passing several small ruins on the way to the park's biggest rock art panel, high above the junction with larger Navajo Canyon. The return half of the loop is across flat land on the mesa top, so the trail encounters contrasting habitats of rocky, wooded canyon slopes and the more open plateau. Much of the route is relatively level, but canyon section has a few short, steep climbs and although most is quite shady, the hike can be rather strenuous, especially during summer. Parking for the trail is in the extended lot either side of the road north of Chapin Mesa Museum, or in the smaller area west of the road, opposite the park headquarters. The hike begins along the paved path towards Spruce Tree House, which winds gently down to the floor of the upper end of a short tributary of Spruce Canyon, where the path divides - the left branch rises slightly to the cliff dwelling, though this has been closed to the public since August 2015 owing to concerns about future rock falls, while the other branch follows the streambed southwards, descending quite steeply through wooded surroundings. A second junction is reached after a quarter of a mile; the Spruce Canyon Trail continues down the ravine, eventually climbing back towards the top of Chapin Mesa, while the Petroglyph Point Trail forks left, up some steps, and ascends nearly 200 feet to the top of a little side ravine. 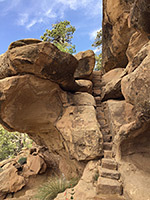 This path comes within 50 feet of the canyon rim, before turning south and thereafter staying fairly level, running along benches, sometimes rising or descending via short slopes or steps. In two places it passes through narrow gaps between the cliffs and fallen boulders. The valley below continues to deepen, as the tributary joins the main fork of Spruce Canyon, which in turn meets Navajo Canyon, over 500 feet deep. The path bends east to curve around another side gully, straightening again and reaching the petroglyphs, at the southernmost point of the hike. Along this latter section are several small ancient dwellings, at least one easily accessible from the path, others out of reach in alcoves above. The panel is extensive, over 20 feet wide, and quite high up so can be difficult to photograph effectively. The designs are somewhat faded but varied, including hand prints, animals, humans, spirals and other geometric shapes. Just beyond the panel, the trail climbs out of the canyon and turns north, running close to but often out of sight of the rim, across flat, wooded terrain all the way to the head of the ravine at Spruce Tree House. The last part crosses a band of slickrock and a small dam, and meets the paved ruins trail just below the museum.